The Odd Fellows Rebekahs Rose Float is a labor of love in which all services by the members are volunteered. No one gets paid to work on the float or the organizing committee. The Odd Fellows Rebekahs Rose Float Organization is incorporated as a 501c(3) Charitable Corporation by the State of California. The corporation is organized to provide an educational experience for the public by teaching volunteers to create and display a work of art in the annual Tournament of Roses Parade in Pasadena California. The corporation performs this objective by its ability to sponsor, plan, and design, build, decorate, and enter a float. The float is a work of art which is viewed by nearly a million people locally in Southern California and is televised to more than 70 million international viewers. The corporation endeavors to promote a culture of caring and sharing, and goodwill to all people everywhere via the themes of its floats, and seeks to elevate the character of mankind. Additional benefits include publicizing the existence and mission of the Independent Order of Odd Fellows (IOOF), and thereby attract new members to the Order. Increased membership strengthens the Order as a whole, and so strengthens support for all of the Order's affiliated charitable projects (e.g. Rebekah Children's Services in Gilroy CA). You can immediately help with a donation to the float fund using the link below. Clicking the donate button will take you to the Odd Fellows Rebekahs Rose Float PayPal donation page. You do not need a PayPal account, most major credit cards are accepted. 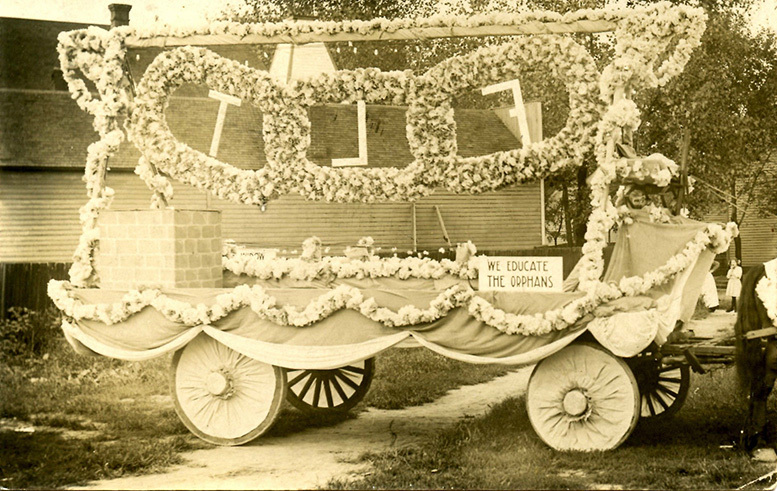 Odd Fellows and Rebekahs have been building and entering floats in parades ever since our fraternal origins in the 1800s. Our floats elegantly demonstrate to the world who we are and what we stand for. Your donations in support of our Rose Parade float are GREATLY appreciated. All donations received, and all monies raised through individual, lodge level, and corporate level sponsorships, and from the sales of T-shirts, collector's pins, postcards, pictures and other memorabilia items go 100% towards the production of the float and to the objectives of the float organization.